This person was not intended to look like, as one 911 caller put it, a guy "wearing a dress with a torpedo on his shoulder," but even people who did finish high school had some concerns when they saw him on a street corner in Phoenix. The incident involved not one but two geniuses. The brains of the operation was a 39-year-old man who said that after the theater shooting in Colorado, he wanted to find out how long it would take police in his area to respond to a similar report. "I wanted to run a little test here in Phoenix, Arizona," he said while narrating a video of the event that he posted on YouTube. "I want to find out how safe I really am, and I want to know the response time of the Phoenix police department." That response time, reportedly: anywhere from three to 15 minutes. The geniuses' video shows an officer arriving at a home at 15:01, but they had fled the intersection by that time so it's not clear how long it took police—or the helicopter or the SWAT team—to get there. 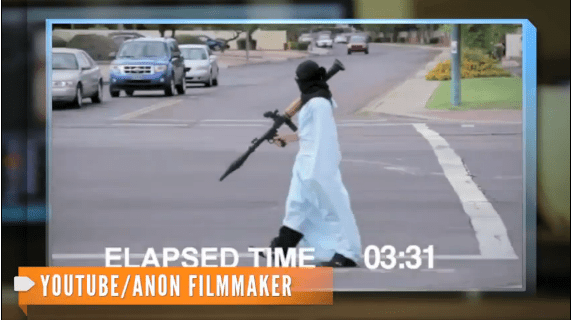 The guy in the dress with a torpedo on his shoulder—actually a guy wrapped in a sheet with a remarkably realistic (but fake) rocket-propelled-grenade launcher—was the man's 16-year-old nephew. That is, rather than run his own test, the guy talked his nephew into dressing like a terrorist to see how quickly police would come get him. Given how jumpy everybody is these days, and the highly realistic RPG, they are probably lucky that one or both of them didn't get shot. On the other hand, the kid was jumping around like an idiot (if real terrorists do that, I haven't seen the footage), and most if not all 911 callers seem to have understood this was a prank, so people did not overreact. The officer who arrived at the man's home was said to have remained calm, and left (after taking their names) when the man told him they were "just filming a movie." Still, on Monday (almost two months after the incident) police did arrest the man. They charged him with endangerment, which seems potentially valid, and "creating a false impression of a terrorist act," which to me is more questionable. If what someone did endangered others, that's a crime, so why do we need to pile on with more "anti-terror" laws that at least potentially infringe on free speech? The man was also charged with contributing to the delinquency of a minor (I guess so) and "misconduct involving simulated explosives" (same objection).